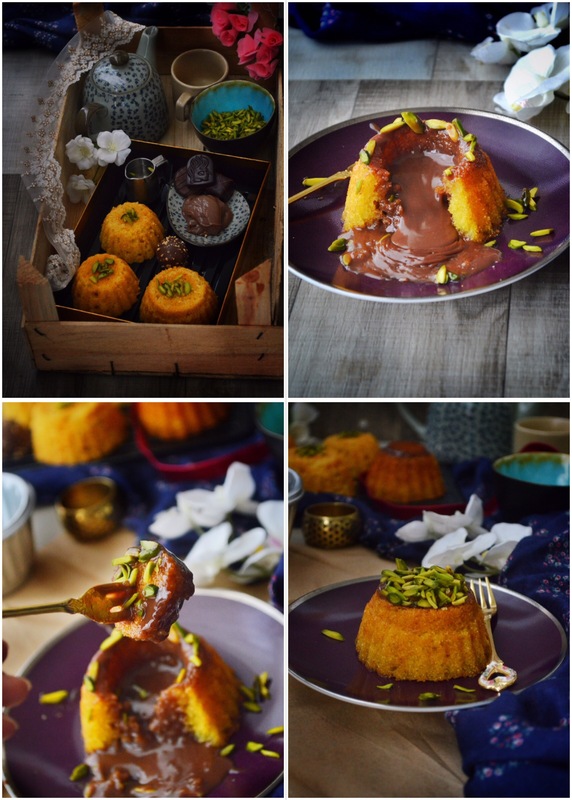 Eid ul Adha is just around the corner, definitely the time when our minds are busy with recipes for fantastic lunch and delicious desserts.Well, here i have for you the recipe of the traditional middle eastern dessert basbousa with a slight twist. It has a molten chocolatey lava flowing from it. Sounds good, right? It looks and tastes good too. 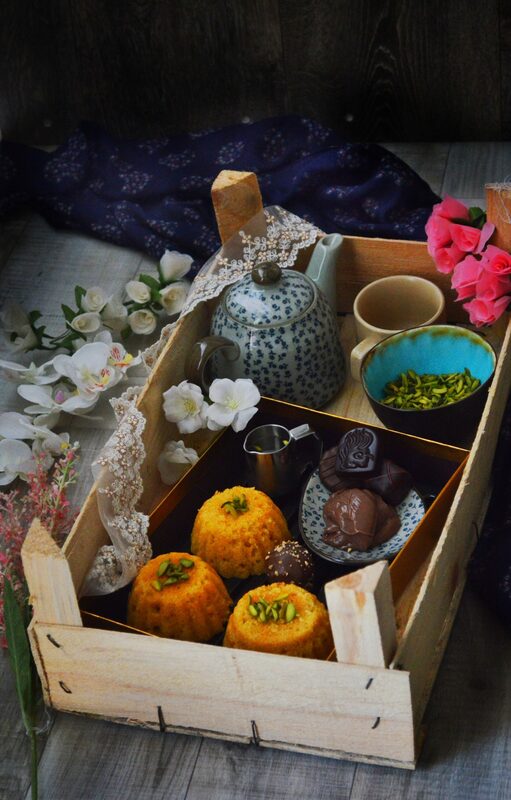 Semolina treats are very popular in the middle east. 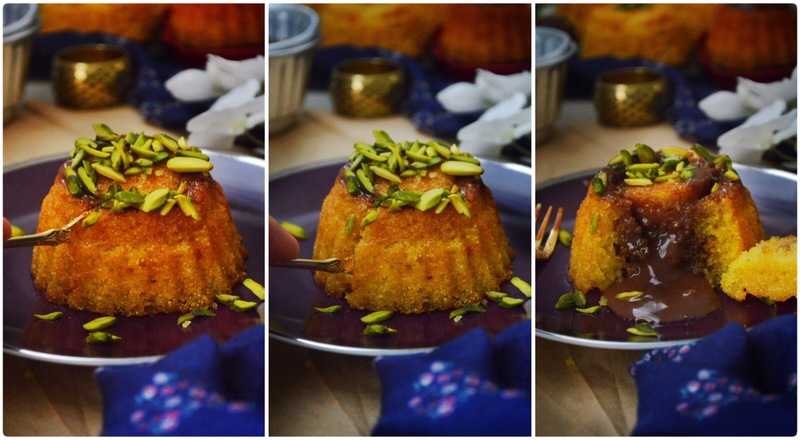 They have many different variations of this semolina cake/basbousa/namoura out there. I have tried many variations but i love my mom’s version of this cake the best. 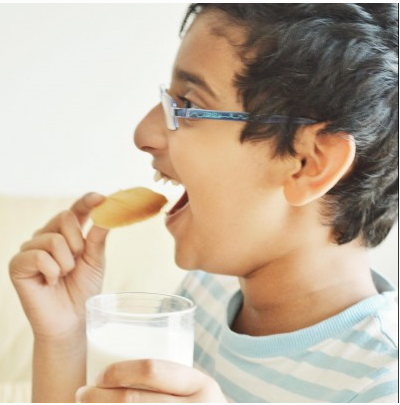 My mom used to make really good, perfect cakes before….before my sis and me entered the kitchen….that was really long time back. But after we took over the kitchen, mom stopped doing her experiments. And now sadly, she doesn’t remember the exact recipes of most of the cakes she baked. 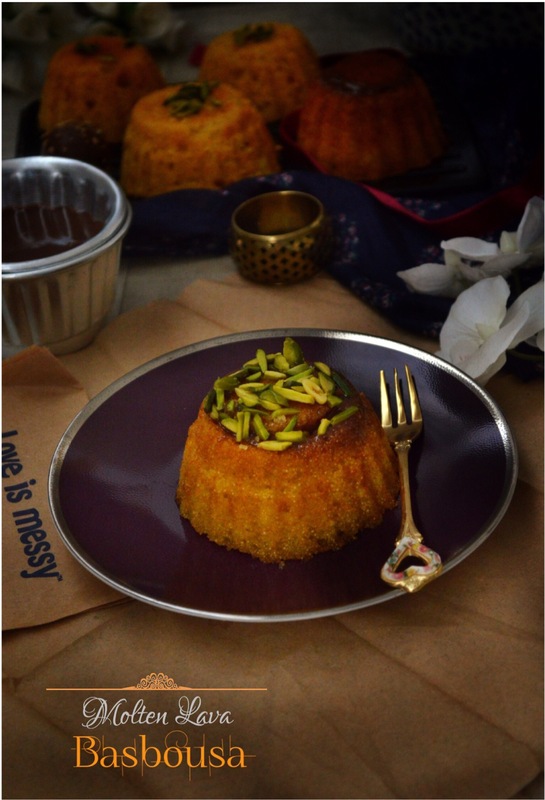 But thankfully, she remembered most part of the recipe of basbousa except for the exact measurement of the semolina. So when i made it first, i guess i added more semolina and the cake turned out really hard. I made it again and i got it right, exactly like my moms moist crumbly cake. I wanted to do something different with this cake and so i thought that it would be cool if there was chocolate goodness oozing out of the warm cake. And yeaah! It was too good a combination of the warm cake drenched in fragrant sugar syrup with chocolate flowing from the center and nice cold icecream to balance it all. 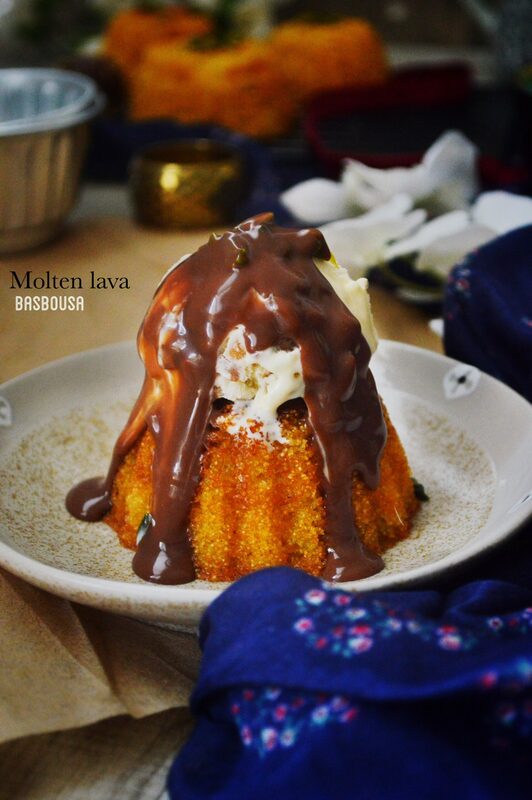 ✔️ Slightly warm the basbousa before serving. ✔️ Pour the syrup over the cake right after you take it out of the oven. ✔️ You can replace rose water with vanilla essence. ✔️ Just before serving, after you warm the cake, open the top piece of cake and pour more ganache and close it again. You are doing this because some of the ganache you poured earlier would have sunk into the cake, not letting the chocolate flow. Then place the scoop of icecream. This way you will have guaranteed lava flowing from the cake when you cut it. Add the yoghurt and mix. Then add in the baking powder, soda and semolina. Fold it in. Grease ramekins, cupcake pan or small individual cake pans generously. Bake for about 20 minutes till well done. Pour the sugar syrup over the cake once you take it out of the oven. In a saucepan, add in sugar and water. Over high heat stir well to dissolve the sugar. Once dissolved, reduce heat to low and simmer for 10 minutes. Turn off heat and add rose water. In a saucepan, heat the whipping cream and butter till it comes to a boil. Pour this hot cream into the chocolate and keep it closed. After 10 minutes, stir it well till chocolate is melted and well incorporated into the cream. Remove the cake from the pan. Let it cool. 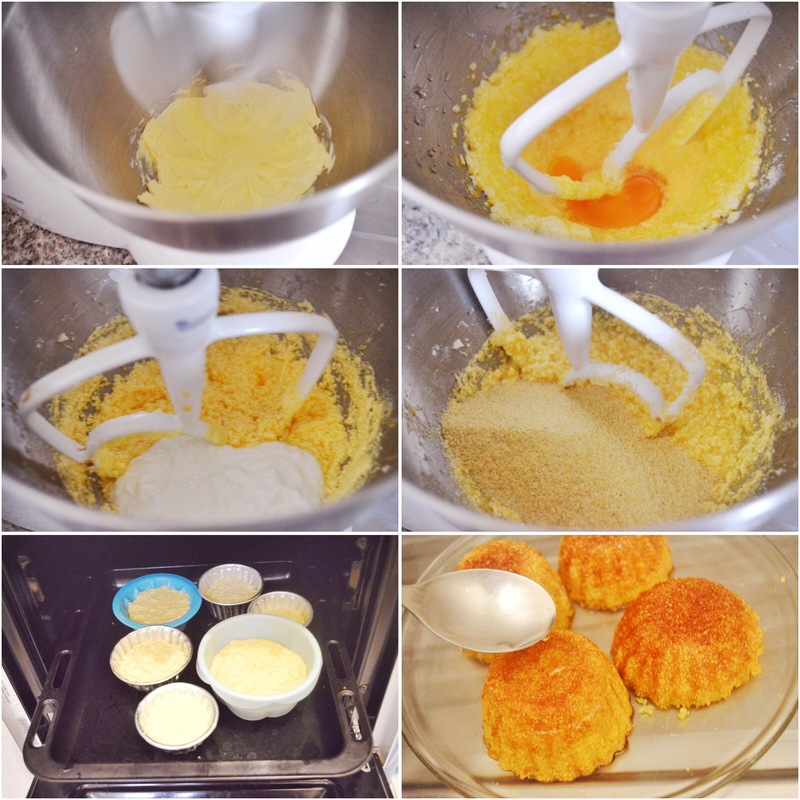 Using a sharp knife, cut out a 1-inch circle out of the center of the bottom of each cake. The hole should be at least 1-inch deep. Scoop out the chunk of cake and discard. But keep the top piece of the cake to cover. Repeat this process with all the cakes. Spoon 2 tbsp or more of the ganache into the holes. Cover it withthe top piece of the cake. Before serving, warm the cake and add a scoop of icecream on top. 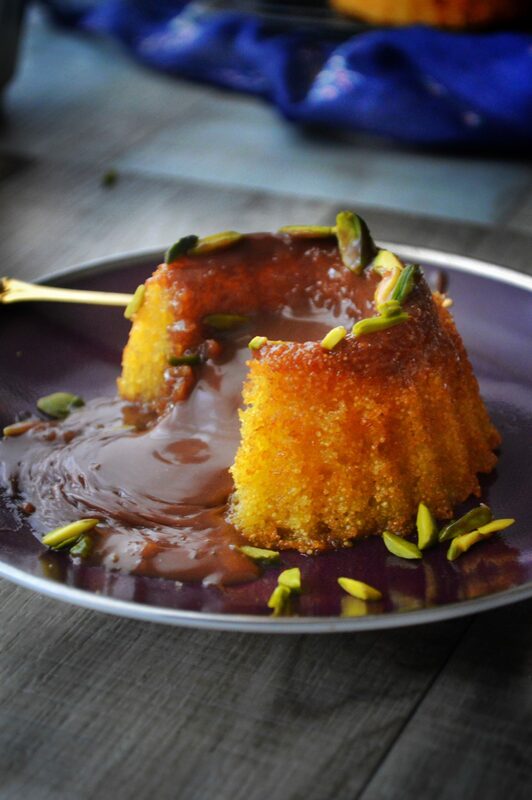 Pour ganache over the icecream and dig in. 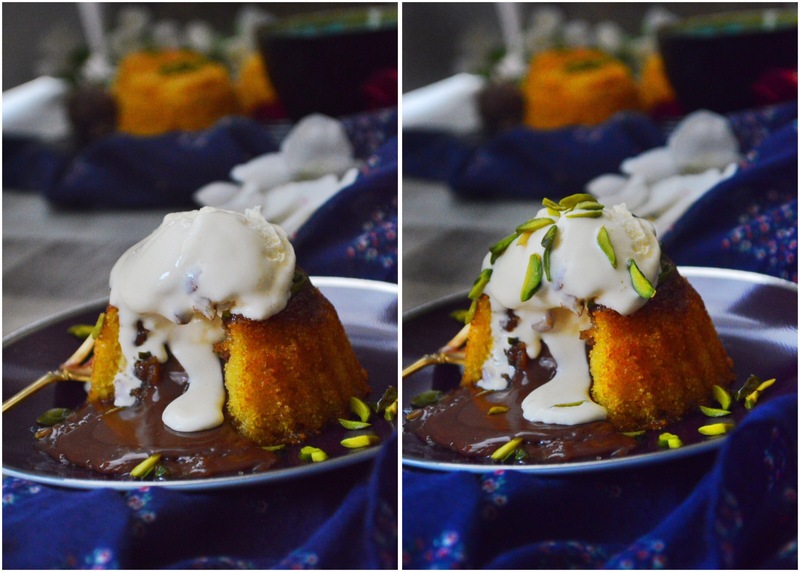 Basbousa, a middle eastern semolina cake with molten lava like chocolate flowing from the center. * Slightly warm the basbousa before serving. * Pour the syrup over the cake right after you take it out of the oven. * You can replace rose water with vanilla essence. 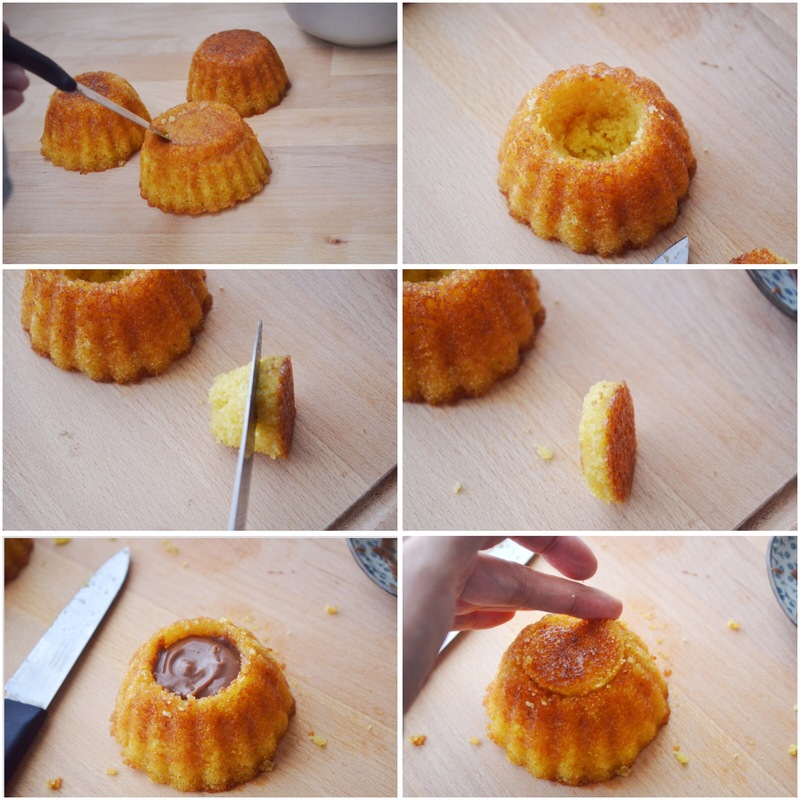 * Just before serving, after you warm the cake, open the top piece of cake and pour more ganache and close it again. You are doing this because some of the ganache you poured earlier would have sunk into the cake, not letting the chocolate flow. Then place the scoop of icecream. This way you will have guaranteed lava flowing from the cake when you cut it. What a gorgeous cake Sadia! I would love to have one of these and wouldn’t rest my fork until it was gone! love your posts so inspiring and cteative , great pics as well . Thanks a lot Safa! Really happy! can this be made a day ahead and rewarmed when serving ? when making day in advance – do I pour the syrup over and fill with ganache then refrigerate ? what temp and how long to reheat next day ? Yes, you can pour the syrup a day before. But fill with ganache the time you are going to serve. 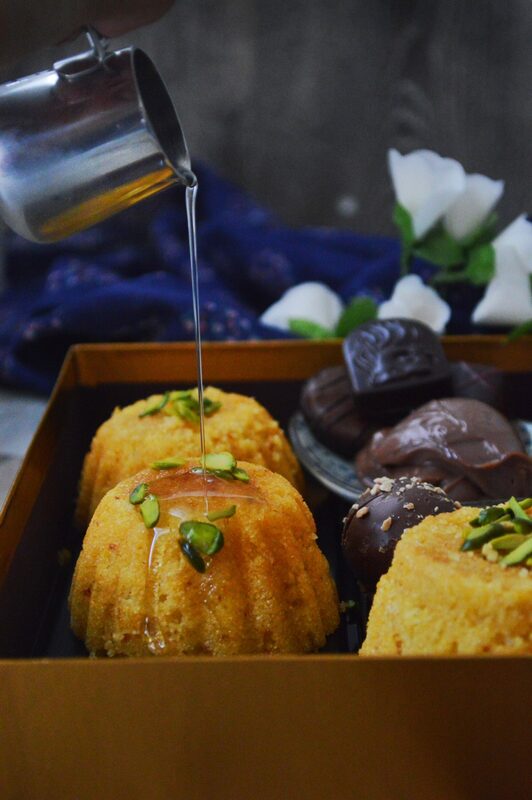 I would suggest that you fill the cake with ganache (which can be prepared a day ahead) and then heat the cake in microwave oven for about 30 seconds. Serve immediately. 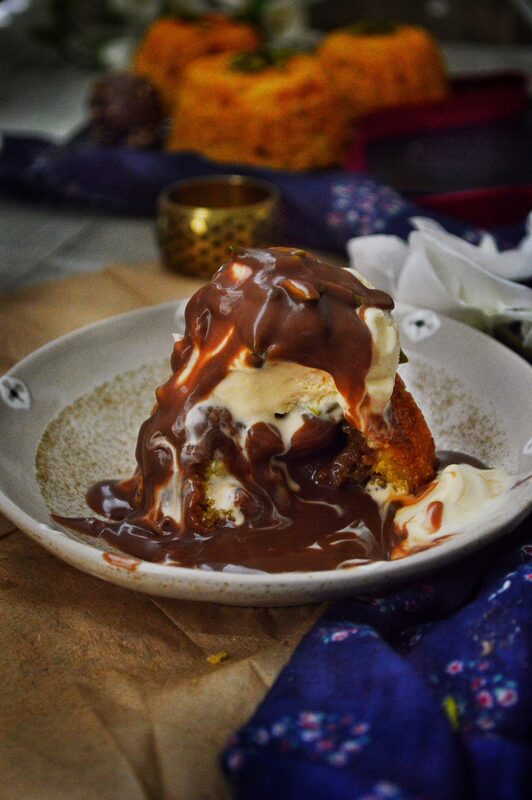 I had 12 people for a Moroccan theme dinner, ending with your spectacular dessert. I actually received applause. thank you for the recipe and for the personal help that you gave me.